Robin Youngs, Edward Fisher,	The Journal of Laryngology & Otology, Volume 129 Issue 3, p 205. G L Garrett, I Beegun, A D'souza,	The Journal of Laryngology & Otology, Volume 129 Issue 3, pp 206-211. K A Wilkinson, H Freeth, I C Martin,	The Journal of Laryngology & Otology, Volume 129 Issue 3, pp 212-216. G Chilvers, I McKay-Davies,	The Journal of Laryngology & Otology, Volume 129 Issue 3, pp 217-225. E L Culver, A Hunt, E Crewe, K A Shah, P Martinez-Devesa,	The Journal of Laryngology & Otology, Volume 129 Issue 3, pp 226-231. W She, L Lv, X Du, H Li, Y Dai, L Lu, X Ma, F Chen,	The Journal of Laryngology & Otology, Volume 129 Issue 3, pp 232-237. J B Spitzer, D Chari, E Machmer, S Lipson, L Rouse, A K Lalwani,	The Journal of Laryngology & Otology, Volume 129 Issue 3, pp 238-243. A S Harris, S J Edwards, L Pope,	The Journal of Laryngology & Otology, Volume 129 Issue 3, pp 244-249. 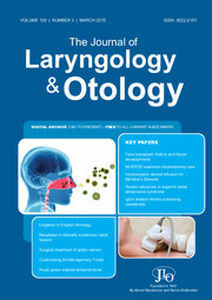 A Bisgin, H Eyigor, U Osma, M D Yilmaz, A D Yalcin,	The Journal of Laryngology & Otology, Volume 129 Issue 3, pp 250-253. P Asimakopoulos, I Hathorn, H Monaghan, A T Williams,	The Journal of Laryngology & Otology, Volume 129 Issue 3, pp 254-260. D S Kelkar, S S Gandhi, G A Oka,	The Journal of Laryngology & Otology, Volume 129 Issue 3, pp 261-266. S Torretta, P Marchisio, L Drago, P Capaccio, E Baggi, L Pignataro,	The Journal of Laryngology & Otology, Volume 129 Issue 3, pp 267-272. A Gan, V Varadarajan, M P Rothera,	The Journal of Laryngology & Otology, Volume 129 Issue 3, pp 273-275. B Farahnik, S Zaghi, L Hendizadeh, Q Gopen,	The Journal of Laryngology & Otology, Volume 129 Issue 3, pp 276-278. J Wood, J Ver Halen, S Samant, N Florendo,	The Journal of Laryngology & Otology, Volume 129 Issue 3, pp 279-282. R P Exley, A Markey, S Rutherford, R K Bhalla,	The Journal of Laryngology & Otology, Volume 129 Issue 3, pp 283-287. C Xie, S Hampal, C Li,	The Journal of Laryngology & Otology, Volume 129 Issue 3, pp 288-292. Recurrent epistaxis in a nine-year-old boy: benign or malignant? H F Dean, S Hadjisymeou, G Morrison, I Hore,	The Journal of Laryngology & Otology, Volume 129 Issue 3, pp 293-295.